WFAA in Dallas features PEP! 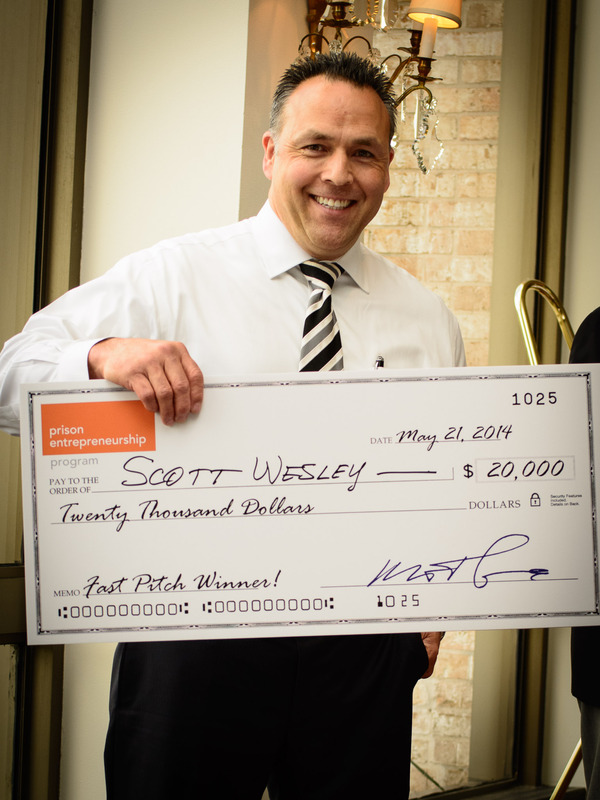 Sebastian Robertson of WFAA in Dallas came to the Estes Unit on Friday morning, March 4th, and captured the story of one of the business plan finalists. Can free enterprise redeem the incarcerated? An hour north of Houston, over 70 suit-clad volunteers shuffle into a place most fear to enter: prison. Greeted by CEO Bert Smith and his staff, these “executive volunteers” – drawn from Houston’s elite business community – are there to counsel prisoners in entrepreneurship. Without a dollar of government funds, the Texas-based Prison Entrepreneurship Program (PEP) trains prisoners to start their own businesses upon their return to society. 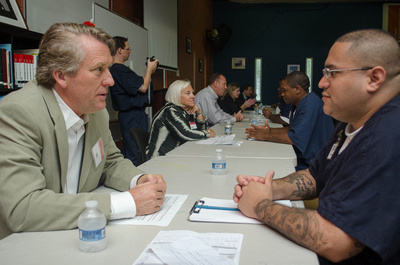 It not only offers education and community within the prison’s walls but also gives participants the tools to succeed in life after prison through re-entry, employment, and social opportunities. According to Smith, PEP “trains up men to gain a complete understanding of what it takes to run an honest business and build social capital.” That innovative approach, different from your average prison-based program, is already reaping rewards. PEP graduates are dramatically better off than their non-PEP counterparts, being significantly less likely to re-offend and more likely to hold down steady, well-paying work, according to a Baylor University study. PEP emphasizes that it is “a hand-up, not a hand-out.” Participants are selected from across Texas’s prison system through recruitment and screening. After being selected, they are transferred to one of two prisons where PEP operates. Program participants start a 9-month program that includes a Leadership Academy — a character building course — and a crash course in business and entrepreneurship that culminates in a competition to determine which would-be entrepreneurs’ business ideas hold the most promise. PEP even convenes “Venture Capital Panels”— like in the TV showShark Tank – where executives volunteer to judge the budding entrepreneurs, listen to their elevator pitches, and offer feedback. Upon completing the program, successful participants graduate and receive a “Certificate in Entrepreneurship” from Baylor University. Astoundingly, the program places 100% of its graduates in work within 90 days of release. Many achieve it much sooner. After 12 years of operation, the program has built up a network of 750 Texas employers that have placed a PEP graduate in gainful employment. The average starting wages for PEP graduates are 60% higher than minimum wage. After 6 months on the job, graduates earn an average of almost $16 an hour. Though PEP is underpinned by Judeo-Christian values, participants are drawn from all races and creeds. Only men may apply, and above all other qualities PEP looks for in the competitive application process, applicants must demonstrate a commitment to changing their lives for the better. That shared commitment to building a new life fosters palpable camaraderie among the inmates. PEP participants – most of whom have been wards of the state before – call each other “brother” and consider volunteers and staff “family.” PEP’s “10 Driving Values” (including “excellence,” “accountability,” and “fresh start outlook”) are hung around the room PEP occupies in the prison and shape every activity and interaction. Participants are asked to speak in front of volunteers and other participants regularly. They are also given business cards that they distribute to volunteers with the hope of connecting with them upon their return to society. Upon release, PEP staff meet the participants at the prison gates and start the re-entry process – acquiring civilian identification, medical insurance, food assistance, and basic necessities like toiletries and clothes for a job interview. PEP also runs transition housing for graduates and assists with job placement and parole compliance. To date, PEP graduates have started 211 businesses with six of those exceeding $1 million in annual revenue. In addition, the vast majority of graduates stay on the straight and narrow. The latest available data suggests that less than 7% of graduates have been re-arrested in the three years since release— an astonishing figure given national recidivism rates exceed 50% in most jurisdictions. PEP accomplishes all of this on a shoe string budget of $2.4 million in 2016 with mostly volunteer labor. Ninety percent of its paid staff are PEP graduates themselves. In many ways, PEP embodies the American Enterprise Institute’s mission of “increasing individual opportunity and strengthening free enterprise.” Deep in the heart of Texas, this little platoon of society is serving its fellow man by promoting self-sufficiency, free enterprise, and hope among those society often deems unredeemable. By believing in participants and empowering them with tools for success, PEP is helping to reduce America’s high recidivism rates – a phenomenon AEI scholars including Robert Doar, Maura Corrigan, and Sally Satel have highlighted in the past. PEP may offer a path out of the vicious prison cycle toward a freer, safer, and more prosperous society for all, beginning with ex-offenders. 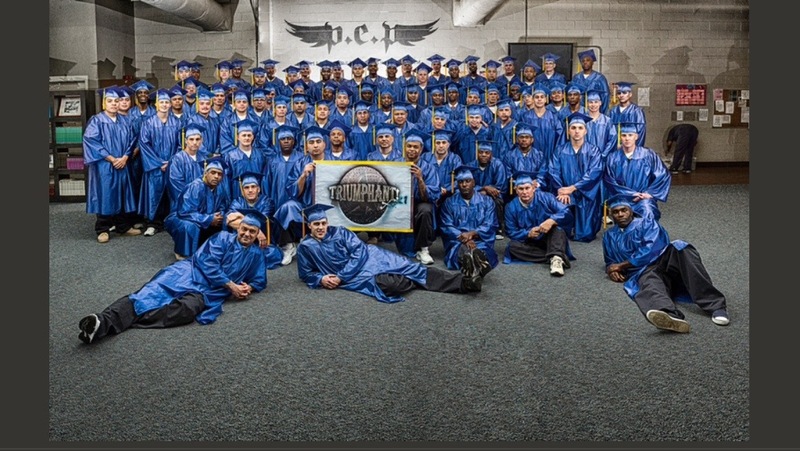 The 22nd Class of the Prison Entrepreneurship Program will graduate on the afternoon Friday, December 12, 2014 (you can learn more about that event here). That day, these men will complete our 6-month Business Plan Competition and earn their Certificates in Entrepreneurship from Baylor University. At this important event, volunteers (i.e. YOU!) will conduct Mock Interviews with our graduates before they release form prison. This is a great way to prepare our guys for the daunting task of answering “the felony question” in interviews. Plus, it gives them one last chance to polish up their happy dances for when they do land a job. Help us to maintain a 100% employment rate…. RSVP today! Have you ever hired someone? Or are you the master of the one-on-one job interview? If so, we need your help on Friday, June 13, 2014 from 1:00 – 5:00 at the Cleveland Correctional Center in Cleveland, Texas (about 45 minutes North of Houston)! After our participants graduate from the business plan competition, we give them a week to relax … then focus them on the most critical next step of their transformation: securing immediate employment upon release. After they leave prison, we strongly encourage all of our graduates to secure a job and stabilize in the free world before launching their own business. This final PEP event, The Employment Workshop, serves as the capstone of our in-prison initiatives. Volunteers offer “mock interviews” as fictional employers. A perfect fit with owner-operators and HR professionals, this event provides graduates with a chance to sell their real product… themselves!